20. The regional headquarters of the Jewish Agency for Israel (Sochnut, JAFI) is housed in a suite of offices and program rooms in a modern building in Dnipropetrovsk. The Dnipropetrovsk center also supervises JAFI coordinators in Krivoi Rog, Zaporizhya, and Melitopol, as well as volunteer representatives in Alexandria and Kirovograd. Its major mission centers on Jewish identity-building through formal and informal Jewish education and it encourages emigration of local Jews to Israel (aliyah). 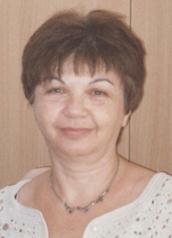 Lena Zbarzhevsky, a native of Dnipropetrovsk, is now in her second year as JAFI director in the city. She had left the city as an adolescent when she emigrated to Israel with her family. Ms. Zbarzhevsky said that aliyah from the Dnipropetrovsk area, which had increased 30 percent in 2011 over 2010, had decreased 30 percent so far (through April) in 2012; however, she continued, it is likely that aliyah will grow in the next eight months and it may equal or surpass the 2011 numbers by the end of the year. In response to a question, Ms. Zbarzhevsky said that any of three factors usually motivate local Jews to emigrate to Israel: (1) family reunification with family members living in Israel, including older people whose adult children have already resettled in Israel; (2) young adults seeking a better future than believed likely in Ukraine; and (3) individuals with health issues seeking better medical care in Israel, including both elderly people and families with children afflicted by chronic health conditions. Taglit (birthright Israel) continues to be a major force in encouraging aliyah among Jewish young adults, said Ms. Zbarzhevsky. JAFI offers four Taglit trips for the region annually, two in the summer and two in winter; most departures have long waiting lists, she observed. (One busload accommodating 40 participants constitutes a departure.) Hillel and the Israel Culture Center also organize Taglit trips, Ms. Zbarzhevsky stated, commenting that Taglit is a popular introduction to Israel for many Jewish young adults. Although JAFI no longer is able to provide dedicated funding for Taglit follow-up activities, the JAFI office does some post-Taglit programming anyway. Some Taglit veterans perceive the MASA program as a logical next step, especially if they are considering aliyah to Israel. In answer to a question, Ms. Zbarzhevsky stated that 65 young adults left the area in September 2011 to participate in MASA programs in Israel, 40 additional MASA participants departed for MASA programs in April 2012, and another large group would leave in September 2012. A MASA fair showcasing different MASA programs was scheduled for late May in Dnipropetrovsk; 150 young people already had registered to attend. Asked which MASA options were the most popular, Ms. Zbarzhevsky responded that participant choice was heavily circumscribed by required co-payments; some of the most attractive MASA courses were very expensive and thus effectively inaccessible to local young people. Among the most appealing were generously subsidized Russian-language courses with concentrations in general Israel studies and Zionism, photography, or computer technology. A course based at Kibbutz Ein Tzurim that includes significant content in modern Orthodox Judaism is popular with young people who are not halachically Jewish and are seeking to convert to Judaism. JAFI is planning to enroll approximately 260 children and students in summer and autumn residential camps in 2012, responded Ms. Zbarzhevsky to a question. Approximately 80 youngsters between the ages of 12 and 14 would be offered places in an eight-day residential camp near Dnipropetrovsk, and another 80 adolescents between 15 and 17 are expected to attend a 10-day camp; the extra two days for older youngsters is made possible by a grant from ICHEIC (International Commission on Holocaust-Era Insurance Claims) in return for some Holocaust-related content in the camp. A student camp enrolling 80 university and institute students would be held in October during an eight-day vacation period; student camps used to be operated at the end of August, but the dates were changed in order to accommodate students with summer jobs and/or who had participated in August Taglit trips. The JAFI offices in Dnipropetrovsk and Krivoi Rog operate Sunday schools for local Jewish children, but lack funding for additional children's programs. Certain programs for students still continue, as do some courses in Jewish tradition for adults. JAFI also operates a number of Hebrew-language ulpans throughout the region, all of which incorporate Jewish tradition in the teaching of Hebrew. Questioned about the impending move of JAFI into the new Menorah Center, Ms. Zbarzhevsky said that JAFI would have somewhat less space (330 square meters) in the new facility than in their current premises (450 square meters) in a commercial office building. However, the difference in total space might have little functional impact, she noted, because a large area in their current office is occupied by a long corridor. The new office would have little wasted space, she said. Ms. Zbarzhevsky was far more concerned about her own heavy workload and anticipated loss of employment. Due to severe budgetary constraints, several pro- fessional and support positions in the local JAFI office had been eliminated so she was now fulfilling multiple responsibilities as administrator, manager, aliyah coordinator, and record-keeper, she said. She described her position to the writer as a clerk, saying that she spent 60 percent of her time doing paperwork, writing reports for different JAFI depart-ments, such as aliyah and finance, each of which has its own format. Earlier, she continued, she was able to spend about 75 percent of her time communicating with local people, but that level of contact no longer is possible. Ms. Zbarzhevsky was informed shortly after the writer's visit that her contract would not be renewed and she returned to Israel with her husband and son in July. JAFI does not issue contracts for such positions for longer than one year, a policy with which Ms. Zbarzhevsky was familiar. Her replacement is considered better qualified to represent JAFI in all of eastern Ukraine, a necessity now that the Kharkiv-Donetsk JAFI office has been closed. Ms. Masakovskaya also left JAFI. 21. Esther Katz, an Israeli, directs the Dnipropetrovsk regional office of the American Jewish Joint Distribution Committee (often referred to as JDC in the United States and as Dzhoint or Joint) in Ukraine and Russia. Joint currently assists approximately 7,500 elderly clients in the city and its environs, said Ms. Katz. About 4,500 receive core welfare services, including food parcels and home health care assistance, she explained, and the remaining 3,000 receive more periodic services, such as invitations to holiday celebrations and assistance in arranging medical examinations and medical care. JDC also provides services to about 3,000 families in the area, with particular attention directed to at-risk children. Ms. Katz expressed concern about "spirals of stress" in some families, referring to intergenerational stress or stress that is apparent in both mothers and their children. JDC now is seeing stress among young mothers who were JDC clients as children; the young mothers are not effective parents and, consequently, their children are becoming second-generation Joint clients. JDC has developed several programs for young families that attempt to address these issues, but these are not always effective in addressing underlying problems. 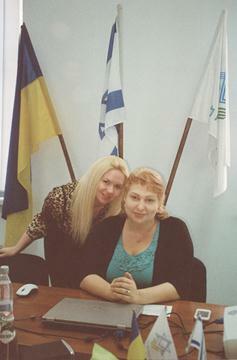 Esther Katz, right, has now represented JDC in Dnipropetrovsk for two years. JDC operates a small community center in a building attached to the Golden Rose Choral Synagogue. The JCC offers art, drama, music, and other programs for children and teens. JDC also conducts a leadership development program known as Metsuda, a year-long course for selected students and young adults; participants learn about the Jewish community and its needs, develop their own projects, and are helped to build leadership skills. Metsuda is intended to prepare both lay and professional leaders, Ms. Katz said. Asked about JDC priorities for the future, Ms. Katz said that she would like to further develop existing JDC programs for special needs children, perhaps building a life plan for each child in collaboration with the child's parents. A second priority, she continued, is reducing the social isolation of elderly Jews, especially those who live in older buildings with no elevator and/or in buildings with elevators that frequently are out-of-service. Young volunteers could be organized to visit homebound elderly, she observed. She would like to re-start the JDC warm home program, perhaps on a small scale with eight to ten people meeting in apartments. A third priority, she continued, is developing a dedicated program for people in early stages of Alzheimer's disease. In the near future, she noted, JDC will move its hesed activity into the Menorah Center and will need to adapt its hesed programs to the space assigned to it in that facility. The new premises are smaller than the area in the current hesed building, so the possibility exists that the hesed will be cramped. In addition to the smaller program and office space, JDC may have to purchase new furniture for its hesed activity; existing furniture in the hesed is old and needs to be replaced. However, Ms. Katz said, it has not been clarified whether the developers of the new Center will provide furnishings or whether JDC will be required to purchase new furniture. The hesed building itself is in poor condition and probably cannot be renovated; it should be torn down, Ms. Katz asserted, and the property used for other purposes. 22. Nativ was established in the 1950’s as the Lishkat Hakesher (Liaison Office) by the then Prime Minister of Israel to operate covertly among the Jewish population of the then Soviet Union, maintaining contacts and assisting immigration of Soviet Jews to Israel. Although the rationale for its maintenance in the post-Soviet era has been questioned, it continues to exist under the influence of Russian-speaking immigrants in Israel and is responsible today for managing Israeli consulates in the post-Soviet states; in that capacity, it issues Israeli visas to new immigrants. It also operates Israel Culture Centers (attached to consulates) in a number of cities with significant Jewish populations. The Kharkiv office of JAFI supervises its programs in Donetsk and the surrounding area. MASA programs are five months or longer in duration and are offered in different languages in order to appeal to different markets. Some young people from Ukraine and other Slavic countries speak English sufficiently well to enroll in English-language courses, which may be more attractive (such as one focusing on architecture), but these often require co-payments of $5,000 or more and thus are beyond the means of many Ukrainian participants. MASA experience to date shows that 40 percent of Russian-speakers enrolled in MASA courses change their entry status to that of new immigrant while in Israel and remain in the country following completion of the course; another 40 percent return to Ukraine or Russia for a few years and then immigrate to Israel. The remaining 20 percent build their lives in the post-Soviet states; many of them subsequently become active in local Jewish communities. Ms. Zbarzhevsky noted that MASA also subsidizes enrollment of daughters of Chabad rabbis who learn in post-high school Chabad seminaries in Tsfat and Jerusalem. Questions have been raised about the propriety of offering such financial aid to these young women, many of whom would attend the seminaries without subsidies. See pages 55-57 about the JAFI Kharkiv-Donetsk office. Ms. Masakovskaya (see photo on opposite page) left her position in JAFI to care for her newborn son. See page 24 regarding services provided by Hesed Menachem, the JDC welfare center in Dnipropetrovsk. See pages 30-31 for information about warm home programs operated by Adopt-a-Bubbe, an organization that JDC ignores. The existing hesed building is a large former preschool that is well-located in the center of the city. The JDC office itself is in a commercial building elsewhere in the city and will not be moved into the Menorah Center.